The high-energy retro-swing sextet The Midnight Serenaders. Performing 1920 – 40’s Popular Music, Hot Jazz, Hawaiian Instrumentals & Blues! Proving that hot jazz and vintage swing of the 1920 – 40’s is as relevant as ever in the present day, the Midnight Serenaders provide an infectious and irreverent take on the raucous and carefree music of “The Jazz Age.” The band formed in 2005, putting together a sound reminiscent of the small swing combos popular during the 20’s and 30’s, adding a Hawaiian flavor with the inclusion of ukulele and Hawaiian Steel guitar, with lots of clarinet and muted trumpet. Led by the charming frontline of crooner/rhythm guitarist Doug Sammons and ukelele-strumming chanteuse Dee Settlemier, the Serenaders’ repertoire consists of specially chosen gems from the past, as well as vintage sounding original songs. The Midnight Serenaders are based in Portland, Oregon and perform at clubs and events throughout the Pacific Northwest, continuing to delight audiences with their brand of hot retro-swing. There are 4 Midnight Serenaders’ recordings. Click on a cover to listen to samples of the tracks or to purchase! Visit our Recordings page for more information and reviews. The HOT LOVIN’ JAZZ BABIES: Doug Sammons & Dee Settlemier, along with bassist Pete Lampe, have a side project they call the Hot Lovin’ Jazz Babies, a septet that focuses on performing dance music for Portland’s vibrant swing dance community. You can visit their web site at Hot Lovin’ Jazz Babies. Just so you know, all four of the Midnight Serenaders’ CD’s are now available for $12.00 each from CD Baby. Visit our CD Baby page to listen to samples and make purchases. 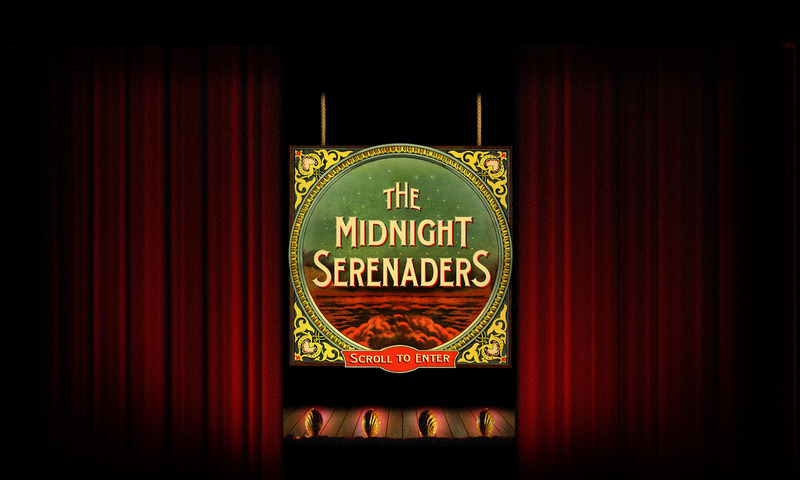 The Midnight Serenaders are available for just about any kind of event, including: clubs, festivals, dances, weddings, corporate events, private parties.